Home › Promotions › Gear Up on Us! Get Geared Up to RIDE! Purchase any new Harley-Davidson® Motorcycle and get Geared Up on Us! 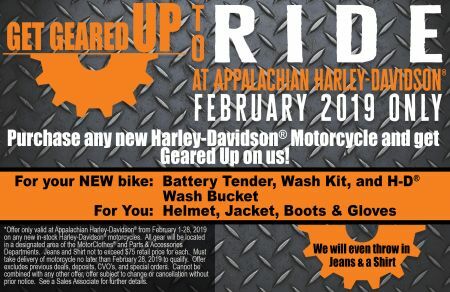 This month only (February 1-28, 2019) only at Appalachian Harley-Davidson®.